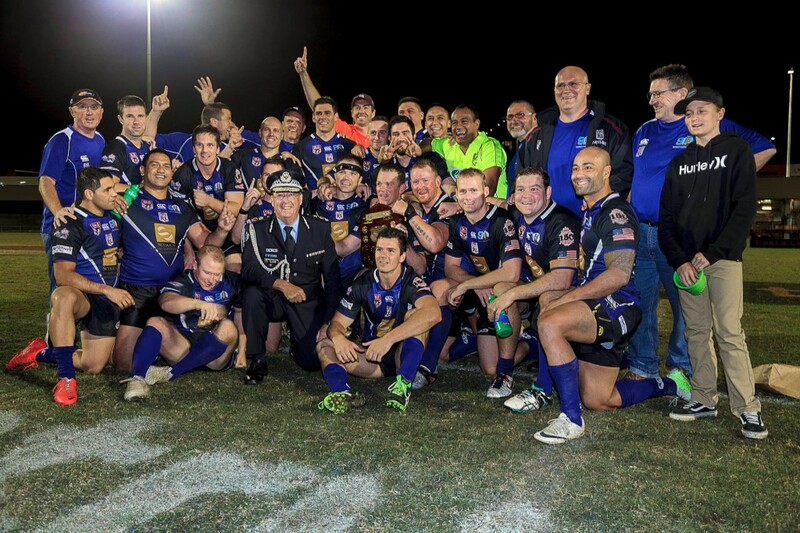 The Queensland Police Service Rugby League Association (QPSRLA) State Rugby League Team participated in the annual 9-11 Memorial Rugby League Game against a representative side from the Queensland Fire and Emergency Service at Langlands Park, Coorparoo on Saturday 30 August 2014. This event honoured the emergency services personnel who lost their lives in the September 11 terrorist attacks in New York. The game was played in the usual ‘hard as nails’ manner with neither team giving any quarter to the opposition. The defence of both teams featured in the first half with no tries being scored however the Firefighters took a 2 to nil lead at the break courtesy of a penalty goal, converted by Ben Wieczorek. The second half was again a torrid affair with both teams looking for an advantage. Devonne Tomuli opened the scoring for the Police with the first try of the game, scored out wide after fifteen minutes. Ben Puia converted with the Police taking a 6 to 2 lead. The Firefighters answered with two quick tries to Dan James and Justin Tyson. The conversion attempts were unsuccessful and the Firefighters led 10 points to 6 with fifteen minutes to go. The Police team threw everything they could at the Firefighters and were finally rewarded with a second try, scored by Matt Hendry with two minutes to go. Ben Puia, under no pressure at all, again converted and the Police led 12 points to 10. The Police were able to hold out and win the match after a very hard and physical 70 minutes. The Patron of the QPSRLA and the Commissioner of Police, Mr Ian Stewart presented the Man of the match award to Jason Klimis of West End Station. The Commissioner also presented the Bob Atkinson shield to Joe Alofipo of the Gold Coast District Dog Squad for the QPS player’s player.